Sgt. Ian Tyler Brooks grew up in the Wood River Valley and served two tours of duty with the Arizona National Guard before taking his own life on Dec. 26. The Wood River High School graduate will be honored at the National Guard Armory in Hailey on Saturday, Feb. 15, from 3-7 p.m. An Idaho National Guard honor guard will present honors at 3:30 p.m., followed by music and food. Friends, family and fellow soldiers will share stories of Brooks’ life. A memorial fund has been set up in Brooks’ name through Higher Ground Sun Valley to help future service personnel return to civilian life. “My son would like that,” said Brooks’ father, Bruce Patton. Patton is a Vietnam veteran and instructor for Higher Ground, a nonprofit organization that provides rehabilitation services for veterans and active-duty personnel returning from Afghanistan and Iraq. 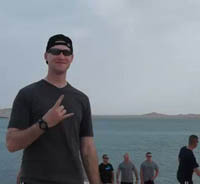 Brooks, who was 25, had served five years in the military—two deployments in the Arizona National Guard on the Mexican border and in Afghanistan—before coming home to Arizona in April. Patton said the cause of his son’s death could be attributed to a type of post-traumatic-stress syndrome. “He died of survivor’s guilt,” Patton said. Brooks was born in Hailey and attended Hemingway Elementary School and Wood River Middle School. He graduated from Wood River High School in 2006. Brooks was a friend of prisoner of war Bowe Bergdahl, 27, who is also from the Wood River Valley. Bert Gillette, program director for military expansion at Higher Ground, said suicide among returning veterans has become an epidemic in the military. “In 2010, the Department of Defense stated that 18 veterans were committing suicide every day. In 2013, that increased to 22 per day. That’s 8,030 per year that we’re losing,” Gillette said. Gillette said the stigma surrounding mental illnesses can keep some soldiers from seeking treatment. “In military culture, they see mental-health issues as a sign of weakness and are reluctant to seek help. For active-duty personnel like Ian, if it comes though that they are having mental-health issues, it could affect their careers,” Gillette said. Patton said his son had applied to Army Ranger School and for helicopter flight training before he ended his life. “That would be a very promising career,” Gillette said. Crystal Brooks said she had been in touch with her brother since he returned from Afghanistan, but that he showed no obvious signs that he was struggling. Donations to Higher Ground can be made at the wake or by contacting Higher Ground Sun Valley at 726-9298.